Become a maverick wildflower grower and help to cultivate change! Wildflower – A flower growing freely without human intervention. Now that you received a packet of wildflower seed sticks with your Genuine Glow purchase, what will you do with them? Protecting and caring for our Earth and environment is crucial, and we want to help remind people of the power, beauty and sustainability that can be found in nature. We believe that small, individual actions can inspire and create big change. Helping to cultivate wildflowers is a simple way to help preserve native pollinators, which in turn helps to benefit the environment, and ultimately the human population. 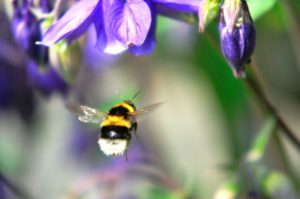 Bumblebees help pollinate many kinds of wildflowers, and that pollination provides the groundwork of a food chain that feeds other insects, birds and mammals. However over the years, the Bumblebee population has been steadily declining due to things like climate change, pesticides, and habitat destruction. Without proper pollination from bees, wildflowers are unable to flourish properly, putting an unnecessary strain on other wildlife, our ecosystem and humans. Join a community of likeminded individuals that are reclaiming our environment one flower at a time. When planted in soil, the paper holding the seeds will biodegrade and the seeds will grow, leaving no waste behind. You can plant these paper seeds in a garden or flowerpot. You can even reuse the Genuine Glow cardboard box your products were shipped in by lining it with a plastic bag and adding soil. Snap a picture of your wildflowers and tag Genuine Glow with the social media links to the left!